Children's shows change with each generation. In my generation, it was The Transformers. The generation before me had Voltes V. The kids of the new millenium are quite lucky. They have Avatar: The Last Airbender. Rarely does a post-2000 cartoon series dwell on some serious stuff like this. We actually have a postmodern mix of Eastern and Western influences. First of all is the style. This cartoon series is produced by Nickelodeon, but the animation style is unmistakably derived from Japanese anime.The reason for that is because this series involves a lot of fighting. And when I say a lot, I mean a lot. Almost every episode (and Book One has twenty episodes) has at least one action sequence. And of course, no one can do animated fight scenes better than the Japanese. Although the fights are not as rough and tumble as that in, say, Dragon Ball Z, Avatar's fight scenes are more toned down (from the influence of Zen Buddhism and Tai Chi), but they still retain the beauty of the moves. Just imagine them in a sort of dance, with fire and water being thrown around, and with a lot of people getting hurt. The concept of having the four elements (Earth, Wind, Fire, and Air) dates back farther than Captain Planet and the Planeteers, and even farther back than the 70s band called Earth, Wind and Fire. This is a popular motif in storytelling, where the mere mention of the four elements conjures up a world of magic and wonder. And the magical world of Avatar is also a mix of different world cultures. 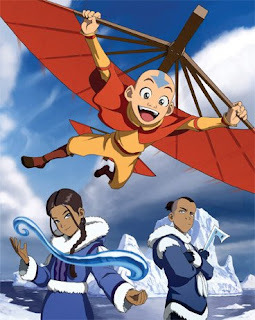 The Water Tribes look like Eskimos and Native Americans, the Earth Kingdoms look like Chinese peasants, the Air Nomads look like Buddhist monks, and the Fire Nation looks like the mighty Japanese Imperial Army. And almost everyone in this mythical world speaks in an American accent (but that shouldn't really bother anyone). In this TV series, an entire season is called a "book," and each episode is called a "chapter." This of course adds again to the mysticism and the feel of the huge epic narrative that the producers intend this show to be. Now I myself never thought I'd be watching this. I used to sneer at this series, thinking to myself "Oh, it's just another one of those trying-to-be-Japanese-but-unmistakably-American shows." But once I got to watch the first episode, I was hooked. So let me warn you, if you are a really busy person, do not even attempt to watch this, because it might hook you as well. Critics call The Sopranos as the most beloved T.V. series of all time. Well, you can't call a series "beloved" after watching only the first season, but let me tell you that the first season is usually an indicator of how good a series is, and this show already displays signs of immortality. Created by Italian-American David Chase, The Sopranos started out as a joke: What would happen if a mobster went to see a shrink? But more than this premise, the show actually gives deeper meaning to the word "family"─first, there's the organized crime family, obviously, of which Anthony "Tony" Soprano (portrayed naturally by James Gandolfini) is one of the top capos. 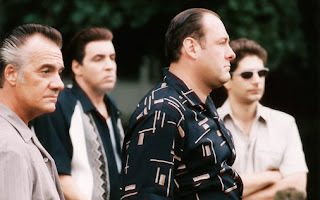 Season One tells the story of the power shift, deciding who takes the place of acting boss Giacomo "Jackie" Aprile after he dies of cancer; the two likeliest candidates are either Tony Soprano, or his uncle Corrado "Junior" Soprano. Second, of course, is Tony's biological family. There's his Uncle Junior, of course, his main rival as the Don of New Jersey; there's his wife Carmela, and their non-mob-related kids; then of course there's his mother, slightly demented but still an ominous presence in Tony's life. It's his struggle between these two families that provides the fuel for the entire show. The first season will make or break a show. It decides if a second season will follow. The Sopranos has everything people look for in gangster films─lies, deceit, murder, and Italian cuisine─and this show will hook gangster fans, and will create new fans as well. HBO shows are always a treat, and this first season will have you anticipating the second.